Here is another coach that DOESN'T PUSSYFOOT AROUND! I had the opportunity to Intern with him and his staff my final semester of Grad School in Spring of 2008. You know he is doing good things if I driving an hour each way just to be around the things that he was doing. The thing I took away was how he even let the Interns coach up the athletes. I finally made it to one of Zach's Live Events and now I am kicking myself for not going to one sooner! I have been a fan of his for a while and he has always been in the back of my mind telling to get a gym going. It took me traveling to Virginia Beach to get the ball rolling. I also had some similarities since he was also a public school teacher. He's "Killing it!" Jim Wendler has to be the best Q and A on the Internet. The way he answers some of the readers questions is similar to the way you would talk to one your buddies at the gym. Not too long ago he came out with 5/3/1. I have been using it with great success and have seen my lifts go up while training with it. Highly recommend it. 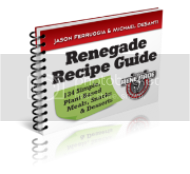 I have been getting useful tips into my inbox for quite some time from Jason Ferruggia. His style is great for the beginner since he focuses on big movements. He has also been training clients for a long time so he knows whats up. I learned a lot about training from Joe's DVD Super Strength. I had never heard or seen some of the exercises until I got the DVD. Another great contribution Joe had was the WS4SB and different ways of getting stronger. I also pay attention when he talks about business because he started training people in a small space. Matt was the great host of Underground Strength Coach Mentorship at Virginia Beach, VA. His gym is ridiculous and there are few things allowed in there that do not inflict pain or get your stronger. He is also very knowledgeable on the Oly Lifts and a STRONG S.O.B. Walking into his gym solidified that you can get started in any space. Well there you have it a long but good post on people that have influenced my training.